It is special that QT has the power and energy to re-introduce this old style movie format to modern audiences, and he matches the length and breadth of some of those epic stories of the past (think “How the West was Won combined with “Pulp Fiction”). What he doesn’t do is tap anything new in his story telling. There is Samuel L. Jackson again, out for a mysterious type of revenge. Peppered in the dialogue is the n-word, yet again, ad nauseam. But at least it’s better and more expressive than “Django Unchained,” which I didn’t like. 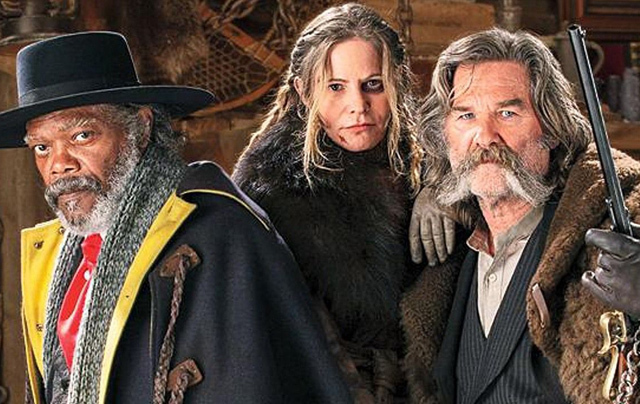 And if you like Django, then “The Hateful Eight” will further float your QT boat. There is a stagecoach to Red Rock in the latter part of the 1800’s, and on that coach is John Ruth (Kurt Russell), a bounty hunter, and his prisoner Daisy Domergue (Jennifer Jason Leigh). Another notorious bounty hunter, Marquis Warren (Samuel L. Jackson), is marooned in an impending blizzard, and hails the stagecoach to hitch a ride. The crew ends up at Minnie’s Haberdashery, an outpost along the trail, but Minnie is nowhere to be found. Inside is Bob (Demian Bichir), who claims he’s working at the store, along with cowboy Joe Gage (Michael Madsen), General Sandy Smithers (Bruce Dern) and hangman Oswaldo Mobray (Tim Roth). The group settles in to ride out the storm, but something is not right.